The Rite of Christian Burial marks the moment at which life is changed, not ended. The funeral liturgy can either be a Mass or Prayer Service and its purpose is to assist families and friends in making this transition as a moment of faith. 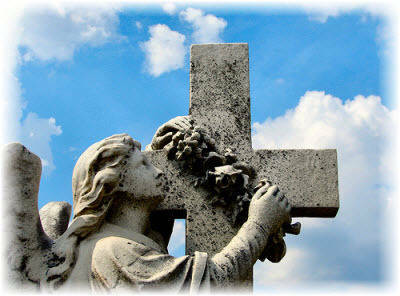 Additionally, a prayer service (wake service) or rosary can be offered on the evening before the funeral service itself . The wake can be scheduled at either the funeral home or the church. The Funeral Mass can be celebrated in either the church or the Chapel of Calvary Cemetery (if that is the place of interment). Anyone wishing to make these arrangements should contact the parish office at 918-744-0023 or the priest’s residence at 918-744-9494 to confirm scheduling. It is recommended and encouraged that the sharing of personal reflections by family and friends (commonly known as eulogies) be done following the wake service, if it is to be done at all. While there is never a charge for receiving a rite or a sacrament, gratuities and honorariums are appreciated and accepted by the officiating minister and are appropriate for special services such as a funeral.